What is a Nevada Eviction Notice? Nevada Eviction Notice: What Is It? A Nevada eviction notice is a written document used by a landlord or property manager to inform the tenant that they’ve violated their rental agreement in some way. The tenant is given specific instructions on what they must do to avoid eviction and the deadline by which the actions must be performed. Nevada eviction notices are more commonly known as a notice to quit. All eviction notices must comply with the state’s landlord-tenant laws. What Are the Components of a Nevada Eviction Notice? The date that the eviction notice was created by the landlord or the property manager. 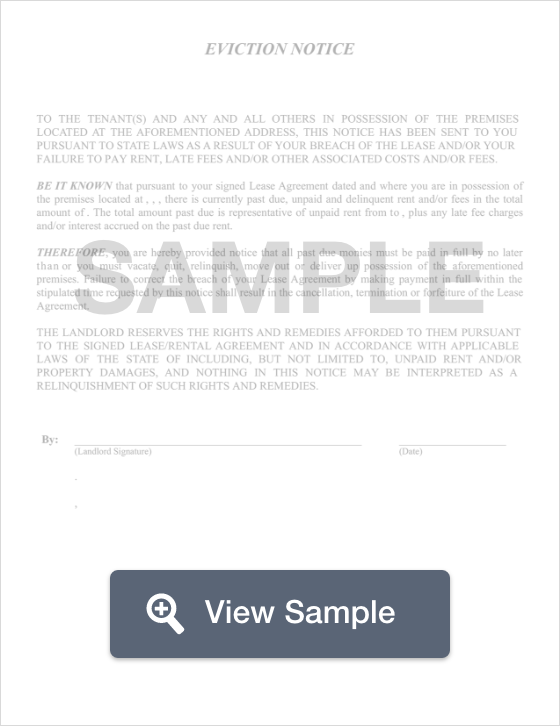 The legal name of the tenant or tenants who signed the rental agreement. Landlords or property managers should double check the names on the lease to ensure that the right parties are named in the eviction notice. The full address of the Nevada rental property. This includes the city, zip code, and the county where the rental property is located. The reason the eviction notice is being issued. The date by which the tenant must take action to avoid eviction or vacate the property. Contact information, including the phone number, for the landlord or the property manager. A Certificate of Service completed by the individual who serves the eviction notice. This section has its own components: the date that service took place, on whom the notice was served, how it was served, and the signature of the server. If the tenant lives in subsidized housing, the landlord or property manager should use these forms provided by the Nevada Courts. Since an eviction notice must be legally served, it’s important for you to understand what constitutes legal service. In Nevada, an eviction notice must be served personally on the tenant or another resident of the rental property who is at least 14 years old. There must also be a witness to service. If necessary, the eviction notice may also be served through certified mail as long as the landlord also attaches a copy of the notice to the front door of the property. Regardless of how it is served, the landlord or property manager should keep proof of service. A 5-day notice to quit for non-payment of rent is used when the tenant doesn’t pay their rent on time. It lists the full amount that is past due, the deadline to pay the rent or vacate the property, the way that the rent may be paid, and where the rent may be paid. This notice is governed by § 40.2512. A 5-day notice to quit for non-compliance is used when the tenant violates the rental agreement in some way (other than non-payment of rent). This is for moderate violations, not severe violations or illegal activity. The landlord should include the description of the violation, what the tenant needs to do to remedy the situation and remain on the property, and the date the problem should be corrected or the tenant should vacate the property. This notice must comply with § 40.2516. A 3-day notice to quit for nuisance, severe lease violation, or illegal activity can be used if the property is being sublet without permission, running an unlawful business, using the premises for illegal activity, using drugs on the property, causing or permitting waste (damage to the property), or causing a considerable nuisance. This notice doesn’t give the tenant the option to fix the problem. They are given three days to vacate the property. The notice should give a clear explanation of why it’s being issued and should give the date by which the tenant should vacate the property. This notice must comply with § 40.2514. A 30-day notice of termination for a month-to-month tenancy isn’t a traditional eviction notice. The tenant doesn’t have to violate the terms of their month-to-month agreement. In fact, if the tenant plans to move, they can create this notice and give it to the landlord. So, the purpose of this notice is for one party to inform the other party that they plan to end the agreement and that possession of the property will return to the landlord in 30 days. This notice should give the date by which the property should be vacated. This notice is regulated by § 40.251. What Are the Legal Considerations of a Nevada Eviction Notice? Eviction is a legal process in the State of Nevada. The forms are different if a landlord wants to evict a tenant from subsidized housing. You can find the right forms from the court website. We linked to those forms under the section above. Eviction notices must be legally served before a lawsuit may be filed against the tenant. Unless and until the landlord receives a court order, they may not remove the belongings of the tenant, turn off the utilities, or change the locks of the rental property. Doing so without a court order is illegal. It may also give the tenant the legal right to sue the landlord for financial compensation. Additionally, landlords may not evict a tenant because of their race, color, religious preferences, national origin, gender, disability, or family status. The landlord also may not evict a tenant because the tenant reports code violations or uninhabitable conditions of the property to the housing authority. Tenants have a legal right to habitable conditions. Tenants have legal rights even during the eviction process. Eviction is a scary process. You should read the eviction notice carefully so that you understand what’s happening and what, if anything, you can do to keep possession of the property. You can also call the landlord to discuss the situation. We discussed illegal evictions under Legal Considerations. Make sure that you read that section. If you believe that you’re the subject of an illegal eviction, you should make an appointment to speak with a landlord-tenant attorney. You could have a legal claim against the landlord. If you cannot afford a lawyer, you can contact Nevada legal aid. If you meet their income guidelines, you could receive free or low-cost legal representation. Your other option is to contact William S. Boyd School of Law and ask if they have a legal clinic. Legal clinics generally provide free or low-cost legal help. Nevada landlords have legal rights and obligations under the state’s landlord-tenant laws. Eviction notices must be legally served before a lawsuit may be filed against the tenant. The eviction forms vary depending on whether the housing is subsidized. If you’re a landlord and you have any questions about Nevada eviction notices, schedule an appointment with a landlord-tenant attorney.